Summary Lightest and thinnest Android tablet yet. But software quirks, lack of ports and SD expansion make it much less attractive. I've been spending the past few weeks with the tablet that is supposed to be the Android iPad2. Although the Galaxy Tab 10.1 is the lightest, thinnest and best put together Android tablet yet, its shortcomings will keep Apple's tablet juggernaut safely at its 90+% market share. I purchased the black 16 GB version for review (model GT-P7510MAYXAB, to be exact). If you want more storage, you can cough up the usual $100 more and buy the 32 GB version (GT-P7510MAVXAB). The Tab 10's key specs are summarized in the boxes to the right, but let's run through some of 'em anyway, eh? The Tab 10 doesn't distance itself from its less-expensive ASUS Transformer and Acer Iconia A500 competition in its choice of processor or RAM complement. It has the same dual-core nVidia Tegra 2 CPU and 1 GB of RAM. The dual-band 802.11 a/b/g/n radio picked up both bands of my dual-band router. I didn't try out the Bluetooth, which the product webpage specs as "Bluetooth 3.0" while the user manual says it's 2.1. No mention of EDR in either spec. GPS isn't called out either, but the Use GPS Satellites checkbox in Location & Security > My Location Settings appears to work. 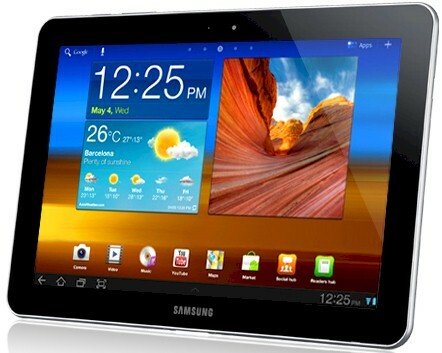 It was nice to see Samsung say that the Tab 10 supports Wi-Fi Direct! Now we just need someone to make a Wi-Fi Direct box like those for Intel's Wi-Di, so that Android users don't have to be envious of iPad's AirPlay. Like Apple, Samsung doesn't want you expanding memory on your own or connecting to anything other than a host Windows or MacOS machine via the supplied USB to custom-connector cable. Samsung is again taking a page from Apple's playbook and says it will offer adapters to add a standard USB or HDMI port. Samsung's spec sheet (below) calls out 3G and 4G models and Liliputing recently reported that Verizon has a 4G LTE model up for pre-order. The diagram below from the user manual shows the ports and controls on the "top and bottom" edges. The rest of the callout diagrams are in the gallery. The power and volume buttons on the top edge won't be accidentally pressed in normal (landscape mode) use. Speakers are on the left and right sides, so won't be muffled if the tablet is lying on a table. The Tab 10 has the "haptic" feedback I found in the Acer A500. And, like the A500, the Tab 10 will still provide "feedback" after you shut it off, although it seemed much less often than the Acer. I like tablets that can charge from a USB charger, so the Tab 10 gets a thumbs up from me. Samsung's charger is nice and compact, too. The Tab 10 is definitely the lightest 10" Android tablet yet. I haven't held an iPad2, but others who have, report that the hefts are comparable. I did a hand-by-hand comparison with my iPad 1 and the Tab 10 felt a bit lighter. The tablet construction is also right up there with the Motorola Xoom and BlackBerry PlayBook in terms of fit and finish. It really puts the Acer and ASUS products to shame, although they are less expensive. Other reviewers have moaned about two second (horrors!) screen rotation times. But the Tab's rotation didn't seem any slower (or faster) than other tablets I've used. I didn't see any big innovations in stability or usability between the $399 ASUS Transformer running Android 3.0.1 and the Tab 10 running 3.1. From reading other reviews, I had thought the skies would clear and angels sing when I fired up Android 3.1. But there are no obvious differences that leap out at you. One annoying thing I did notice was the Tab 10's insistence on modifying browser bookmarks. I'm surprised other reviewers haven't mentioned this. Besides thinking you're imagining things, it's very annoying. I put together Table 1 to summarize the differences between the ASUS Transformer and Tab 10.1 for a test I ran using the Browser app. I first reset both devices to factory defaults, then cleared out all pre-installed bookmarks. I also entered about:debug into both tablets' browsers and checked the user agent setting. The Tab reported "Android", while the Transformer showed "Tablet". I then browsed to three sites, entering the URLS my.yahoo.com, techmeme.com and nytimes.com. The Site column indicates whether the full or mobile version of the site came up on first access. I then used controls provided by each site to switch to the full version of the site and set boomarks, i.e. my.yahoo.com/?m=1, techmeme.com/?full=t, nytimes.com/?nytmobile=0. After closing the browser, then coming back, the table shows that two of the three bookmarks on the Tab 10 were changed to the root domains, i.e. the first slash and everything after it were deleted from the bookmark. This, of course, brought me back to the mobile sites, where I had to do the dance all over again. I was happy to find that I'm not crazy, since this xda-developers thread documents the behavior and attributes it to improper handling of HTTP Response Codes. So the effect is definitely real and I've only encountered it to date on the Tab 10.1. This is not a generic Android 3.1 issue, because the Transformer is also running 3.1 and doesn't have the problem.